The extension is a system extension and is installed by default. In the extension manager you have the possibility to configure the extension. Click on the name of the extension or click the "cogwheel" icon under "Actions" behind the extension name. The location of the "cogwheel" icon under "Actions"
Load Page TSconfig with "New Content Element Wizard" definitions. The definitions can also be loaded manually by including it in a page. - When this option is selected, the PageTSconfig of the extension is automatically included and does not need to be included manually. 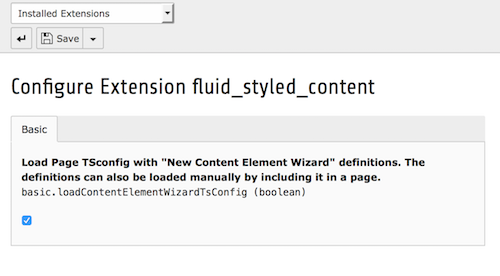 Use this if you have a TYPO3 installation that uses fluid_styled_content everywhere without exception. When you are done configuring the extension, you can store your preferences by clicking the "Save" (you will stay at the configuration screen) or "Save and Close" button (you will be redirected to the extension list).